ELECTRIC vehicle research at Nelson Mandela Metropolitan University (NMMU) took a silent leap forward this month with the temporary acquisition of a Nissan Leaf car. The fully-fledged electric car, valued at R450 000, is on loan to the university for three years as part of an expanded partnership with the Technology Innovation Agency (TIA) and electric vehicle pioneers Nissan. NMMU has been tasked with researching the technology and infrastructure necessary to grow the motor industry of tomorrow on a national level. “We’re moving from the planning to the execution stages where we’ll start testing various technologies,” NMMU’s uYilo director Dirk Odendaal told those who attended the hand-over of the new vehicle in the new Engineering block. Those new technologies include the electric vehicles’ all-important energy storage battery system. A launch of this particular initiative will take place at NMMU in mid-May. 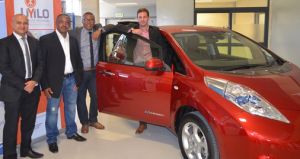 The uYilo team within NMMU’s highly-innovative and successful eNsta technology station will use the new car to test various aspects of their research including suitable locations of charging stations. According to Nissan’s public relations officer Thabo Smouse, South Africa’s first Nissan Leaf customer has only spent R60 on power for both his house and Nissan Leaf car since purchasing his car more than a year ago as his home is powered by solar panels. The cars take eight hours to charge and can cover a distance of between 100 and 120km before they need recharging.